A couple of weeks ago, I decided that I was going to beat this plateau I’ve been hanging onto. I also decided to go all out with getting out of this wheelchair. 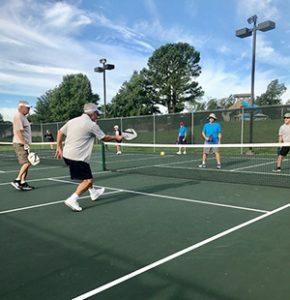 I was watching my husband play pickleball and had the thought “I would love to play that game and I would be good at it”. Memories of my female “jock” past, of playing and coaching both softball and volleyball were whirling through my head. I decided I wanted to create some new athletic memories of my own. I am currently involved with kayaking, which I’m loving and some cycling on my recumbent bike when It’s cool enough and swimming in the indoor pool. But I like the thought of competing in a sport like pickleball or racketball once again. This is definitely going to be work, but after talking with my husband, I signed up for almost a years worth of chiropractic appointments to help straighten and correct my back. His tests showed I have little scoliosis and several issues in the vertebrae in my neck and my low back. I’m starting with 3 appts a week and then going to 2 a week and finally, one a week from Jan-July of 2018. I also asked my GP to prescribe some physical therapy for me. So I’m signed up for 8 PT appointments. This is all costing a bit so I’m determined to make it work for me. I noticed just this week, after 10 Chiropractic adjustments and 5 PT sessions, my left hip pain is much better and my legs are stronger. I’m standing up more and just beginning to walk with my walker again. I noticed I can now stand up some when I’m getting dressed too. I’m taking note of the exercises the PT folks are giving me so I can keep them up when my PT round of sessions is over. I’m also going to the indoor pool several times a week. My goal is to go 3-5 times each week. This is only costing me $3/each time. So between $36-$60 a month. Starting in September, I’ll begin paying $29/month to go as many times as I want. When I’m at the pool, I do 10 laps the length of the pool and back (on my back doing backstrokes). Between each lap, I’m doing 10 water squats in the 3′ area. I know these water squats are really helping me regain my leg strength. I do at least 100 each time I’m at the pool. Then I spend time water walking with my back straight in 4 ft of water and doing stretches at the side of the pool. I’m also spending 15 minutes in the hot tub doing stretches also. I love my time at the pool. My eating is still important and I’ve been having trouble sticking with my intermittent fasting, so I’m working on eating one meal a day and making it ketogenic. I just signed up for a great online course called “Simple keto – Start A Well-formulated Ketogenic Diet“. It is a regular cost of $80, but I got it on sale for only $10. It is on sale until August 31st. So sign up quick if you want to take advantage of the savings, and do this along with me. I’ve taken lots of courses from them before and learned bunches so I’m looking forward to it. We missed our “break fast” meeting at Duffers in August, but I’m planning on scheduling a monthly meeting in September and we will have a special guest, Cathi Warren, who is going to come answer questions about her success with Intermittent Fasting and Ketogenic eating. She has achieved her goals in health and weight loss and can share with us some great tips. This should be very encouraging to those of us on the IF and Keto journey for our health. Thanks for looking at my site and coming to this page. I would love for you to leave any questions or comments below. In addition, I’m open to new topics to research and comment on as they pertain to fasting, both extended and intermittent. Please share your interests and questions in your comments. I also love to hear stories about how others handle their own fasting journey. Also, feel free to share this page with your friends via the social icons.